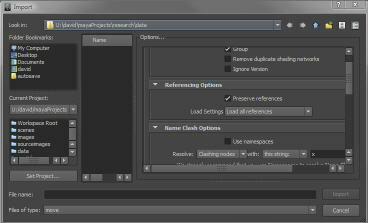 Here's an example: You want to save as maya binary, and you want this to be the default, so you select the "File|Save Scene As..." option box and choose mayaBinary from the "File type" drop-down list, and then you click the "Save Scene As" button to open the save dialog. When the OS native dialog opens you'll see that the "Save As Type" is set to mayaAscii. Sure, you can change it back to mayaBinary, but you'll need to do this every time you save the scene. This happens because the dialog is just using a default list of file types and displaying the first item in the list, when what you want is for it to display the one you chose in your option settings. This problem only affects the "OS native" dialog style and exists for most input and output file operations, including saving images from the renderView window, where the filter type always reverts to Alias PIX (when was the last time you wanted to save one of them?). 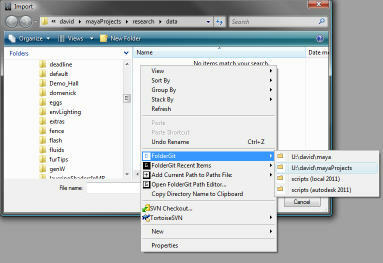 dj_correctFilterList.mel is a script I wrote to reorder the file type filter list correctly based on the settings in the option menu. I then added a couple modifications to 2 maya scripts, projectViewer.mel and renderWindowPanel.mel so that they call my script when they need to load the OS native dialog. If you copy all 3 scripts to your local scripts folder and restart maya then the OS native dialog will respect and remember your file type choices. You can get all 3 scripts from my downloads page (look for dj_correctFilterList.rar). Thanks for this David. We swapped to the OS native because for some reason the "Maya Default" queries all the files in all sub-folders before allowing you to do anything. With our current project structure, that works out to be thousands of files every time you do anything. It was getting to the point that if you accessed our main project directory you'd be waiting 3-5 minutes for any response. Having the filtering work appropriately will be a huge help too. Thanks again. Not remembering the file type in OS native was quite annoying, the only reason I didn't use. Thank you so much. However, there's a problem with exporting. When I try to export the dialog pop up but no file type to choose from and when I click on save, maya crashed. A fix will be great. Thank you so much for many useful scripts. I've only been able to test this on win 7 x64 and vista 64 (with maya 2011 sp1). We've been using it for a couple of months without a problem. I'll email you and get a few more details from you to try and figure out why it doesn't work for you. I think I know what caused the problem. It's something to do with MultiTool plug-in from ticket01.